Glass Fiber Reinforced Concrete (GFRC) products can add significantly to a well landscaped area. Considering a bird bath or meditation bench? GFRC is lighter and more durable than concrete and is available in a number of products. In fact, GFRC can be cast as practically anything you can dream up. With these products you can have the fanciest garden around. You could also choose just one or two and have a calm, meditative space. We can cast these items in any color and most textures you want them in. If your garden is natural stone, we can match that, too. Whether you’re a homeowner or a professional gardener, landscaping can be a chore. It requires hours of hard labor in the sun moving rocks, soil and decorative elements like statues, urns and fountains. Heavier landscaping can be even harder when you take into consideration whole standing structures like pergolas and gazebos. Fortunately, Stromberg Architectural supplies a wide variety of light-weight, yet durable and weather resistant GFRC landscaping products. Our fountains, benches, tables, fountains, gazebos, and every other GFRC product we manufacture are weather resistant, durable and visually stunning. Not only will you have the most attractive garden on the block, you won’t have to work half as hard as you would otherwise. 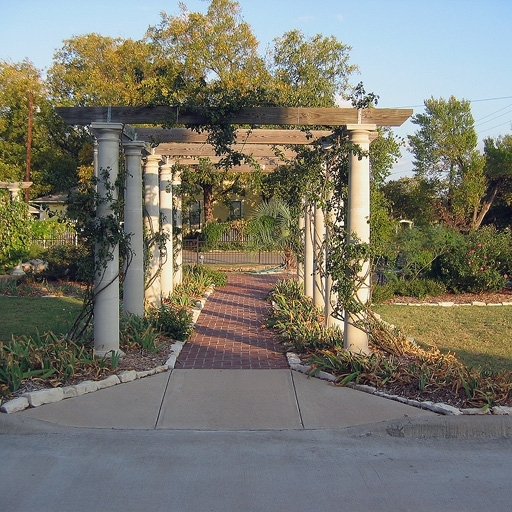 For example, when Kavanagh Methodist Church decided to make a Biblical garden featuring all of the plants mentioned in the Bible, they also decided to include pergolas. These can be seen from the road and draw attention to the garden. An open gate invites people to stroll through the garden. Benches allow for reflection and are additional focal points. The garden achieves its goal of drawing attention to itself with the help of Stromberg GFRC. If you need something to complete your garden, please call us at (903) 454-0904 today or email us at info@strombergarchitectural.com. We will work with you to provide just what you need.